Audible, the world’s largest seller and producer of downloadable audiobooks, has finally entered India with the launch of Audible.in. Like its global counterpart, Audible.in will offer users over 2 lakh full-length audiobooks and original programs, including a curated selection of 400 Audible-exclusive titles by leading Indian authors. To mark the launch, Audible is releasing a new recording of S. Hussain Zaidi and Jane Borges’s best-selling Mafia Queens of Mumbai, performed by Rajkummar Rao, Radhika Apte and Kalki Koechlin. Indian customers can access Audible’s library of global content and membership benefits by signing up for a free 30 day trial, which entitles them to any Audible book of their choice. Amazon Prime members can access a special 90-day trial, including three free audiobooks, at Amazon.in/audible.in. 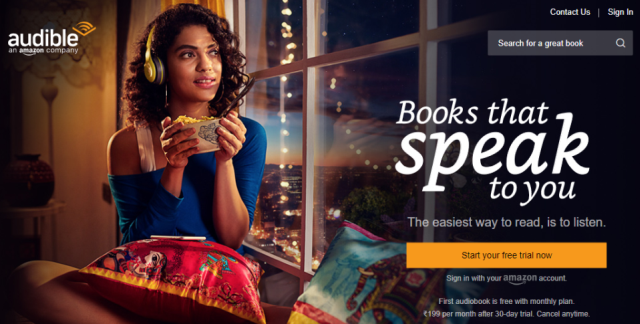 A premium Audible membership costs Rs 199 per month following a 30 day free trial. Members receive 1 credit a month, which can be used to redeem any title from the Audible.in library. Audible members also receive a 30 percent discount from non-member prices on additional audiobooks purchased, as well as access to exclusive sales and content. With a one-month membership trial at Audible, new listeners can enjoy any one audiobook. Audible also offers three prepaid plans with the monthly plan coming in at Rs 299, a half-yearly plan for Rs 1345 (25% discount) and a full year plan at Rs 2332 (35% discount). Non-members can purchase audiobooks a la carte. Among the titles and programs available at launch are, The Last Boy to Fall in Love, an original audio-first title by Durjoy Datta, exclusive audio performances of Rabindranath Tagore’s greatest works, contemporary non-fiction by Rashmi Bansal and Shashi Tharoor, self-development titles by Radhakrishnan Pillai, Guru Om Swami and Ashwin Sanghi, nutrition and wellness titles by Rujuta Diwekar and Pooja Makhija, popular fiction by Preeti Shenoy and Savi Sarma, mythological stories by Amish, Anand Neelakantan, Devdutt Pattanaik and Vineet Bajpai as well as Ruskin Bond’s autobiography, and his other works. Of course, you can also listen to classics and popular works by the likes of JK Rowling, Dan Brown, Yuval Noah Harrari, Agatha Christie Robin Sharma, Dale Carnegie and others. Audible India launches with a “welcome pack,” which has premium long and short-form titles and excerpts including Business Sutra by Pattanaik; An Era of Darkness by Tharoor; A Scandal in Bohemia, a Sherlock Holmes story by Arthur Conan Doyle; Rusty Plays Holi by Bond; Harvard Business Review articles, The Butterfly Effect from Jon Ronson; Nameless Relationship by Shenoy; and Ravana’s Sister by Neelakantan.